The 2019 AT&T Pebble Beach Pro Am will be another rotation of events, where three courses will host the Pro-Am event. Given the nature of the event, all of the golfers will play at least three rounds, including each course once, with the cut to T60 and ties after the conclusion of the Saturday round. Monterey Peninsula has historically played as the easiest of the three courses and is a Par 71 that plays 6953 yards. In addition, the course is the friendliest for DK scoring featuring the most eagles and birdies, including a nine hole stretch featuring three Par 5s that is birdie streak friendly for Showdown. Monterey Peninsula is a coastal course with limited protection from the elements. Spyglass Hill plays as a 6953 yard Par 72 that is the second easiest. Spyglass is a bit inland and has some more protection from the wind. Pebble Beach plays as a 6816 yard Par 72 that is one of the shortest on tour. 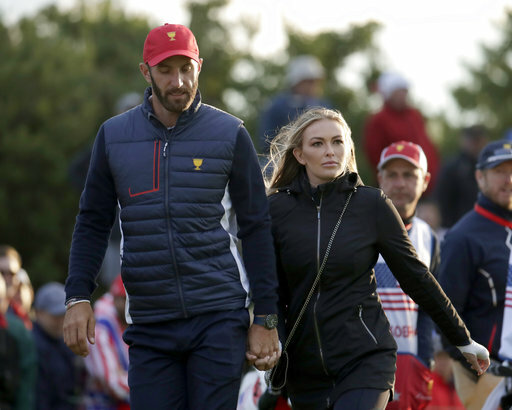 The course could play more difficult this year as it prepares to host the US Open but given the volume of amateur golfers it will certainly play easier than a US Open. The fairways have been narrowed but the rough is still cut to just two inches and the weather has soften the greens. Pebble Beach is also a coastal course with limited protection. There is a lot of talk about potential weather angles this week given the course rotation. The weather forecast is chilly in the 40s and 50s for most of the week. Given the coefficient of thermal expansion the cold nature will lengthen the otherwise short courses, so that will increase the difficulty. In addition, the wind looks potentially brutal at different points in time. Friday has sustained winds ranging from 15-20 mph with gusts nearing 30mph and the Saturday forecast looks to have consistent breeze just north of 10mph. Additionally, the Sunday round which is played on Pebble Beach will have the toughest pin setups, is generally the toughest course, and has brutal wind conditions right now with sustained winds greater than 20mph. Weather can change so it is recommended to wait as long as possible to build your final lineups. In 2014 there was also a lot of wind. 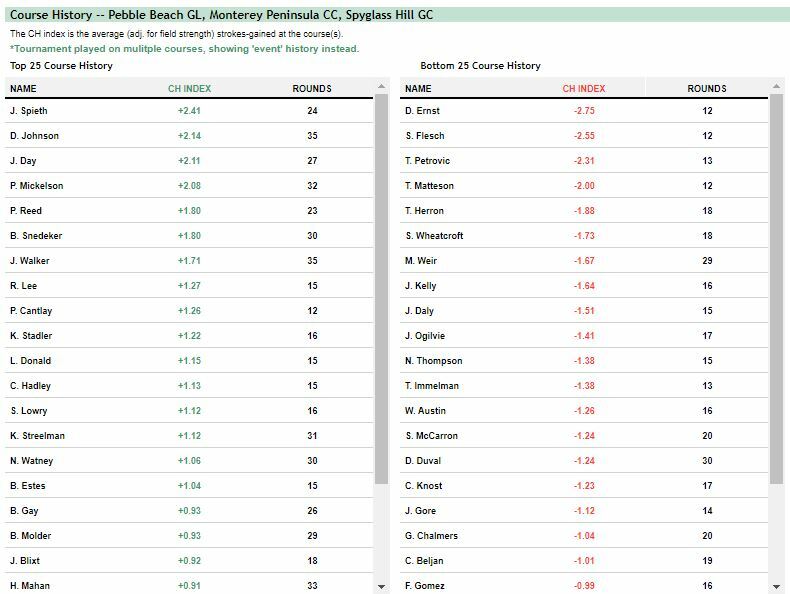 In that round, Monterey shot 3.3 strokes worse than R1-2 averages, Pebble Shot 2.2 strokes worse, and Spyglass Hill just 1.6 strokes worse. Playing Spyglass Hill in the worse conditions seems to be a benefit relative to this field, and perhaps catching Monterey Peninsula to open the event is a benefit. At a minimum it seems like you’ll want to play Spyglass on either Friday or Saturday. I will also probably customize the scoring environment to reflect a higher average score relative to par. Here are the tee times and course rotations. This weeks’ event is just a full field where only the Top 60 so generating 6/6 lineups will be a challenge, but given the scoring environment on Sunday it may not be as beneficial. With less scoring points, the finishing points will be more critical and securing finish points will be critical for cash games and tournaments. The course (Pebble Beach only) has historically emphasized more strokes-gained approach and around the green compared to a traditional tour event, with less emphasis on off the tee play. While that could change a little bit with the cold lengthening the course, it will still be an environment that tests scrambling and approach play. Jordan Spieth has the strongest course history index at this event adjusted for field strength across a small sample, followed by two time winner Dustin Johnson and perennial Top 5 guest Jason Day. The presence of Day and Spieth, as well as Mickelson, Reed and Snedeker, further supports the medium length players that can be elite around the green or with their putter when the game is clicking.